Joseph Margolis is especially known for his systematic defense of relativism and for emphasizing the historical character of human thinking and inquiry. These views are central to Margolis’ general theory of the metaphysics of culture as well as his criticism of “archism”, the philosophical doctrine he claims has dominated most of Western philosophy and continues to be perceptible in parts of contemporary analytic philosophy. Margolis has advanced a sophisticated form of realism. In his view, reality is intransparent, but not opaque. Our cognitive engagement with reality is mediated by our realism, that is, by our changing picture(s) of reality. In that sense, realism is a construction (a picture, representation, or interpretation), a symbiosis of what we deem to be given, presuppositionlessly in experience and perception and unified in thought. Reality is not constructed in this sense, though, independently, we do produce, create, and make culturally significant “things” (transforms of natural or material “things,” that thereby possess or manifest “Intentional” import), which form a part of the real world. Realism and cultural things are thus dependent on our conceptual resources which, in turn, change in the flux of history. Margolis is also a major figure of contemporary pragmatism. One of the central aims of his philosophical work has been to offer an interpretation of the pragmatist tradition and defend this philosophical movement as the most resourceful framework for solving problems in contemporary philosophy and culture. Joseph Margolis’ philosophical career stretches over several decades and his influence has extended to various branches and debates in philosophy. The Metaphysics of Culture – The Philosophy of Joseph Margolis is a conference devoted to the different aspects of Margolis’ vast philosophical work and its contemporary relevance. The conference takes place at the Helsinki Collegium for Advanced Studies on the central campus of the University of Helsinki (Fabianinkatu 24, 1st floor, seminar room 136) in 20-21 May 2013. Participation in the conference is open to everyone interested and free of charge. 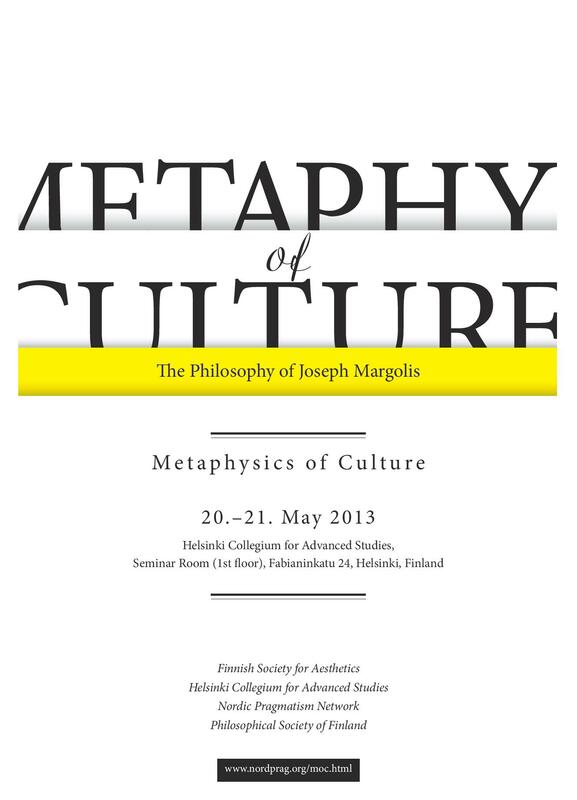 In addition, Joseph Margolis will give a public lecture with the title Toward a Metaphysics of Culture in the University of Helsinki Main building (Fabianinkatu 33, lecture room 10), on 22 May 2012 at 3-5 pm. The organizers invite paper proposals to the conference programme. Please send an abstract of 400-500 words to info@nordprag.org by 31 January 2013. The organizers reserve the right to select presentations based on interest and suitability to the overall conference theme. If accepted to the programme, the abstract text will be displayed on this webpage. A time slot of 30 minutes plus discussion (approximately 15 minutes) will be allotted for each paper. Phillip Honenberger (Rowan University)Margolis on Quine: Fact or Fiction? Public lecture by Joseph Margolis: Toward a Metaphysics of Culture. University of Helsinki Main building (Fabianinkatu 33, lecture room 10), at 3-5 pm. Both artworks and selves, according to the philosophy of Joseph Margolis, are what he calls “culturally emergent entities.” This paper will attempt to show the way that artists, both as selves and as skilled “artists,” by which I mean trained practitioners of doing and making art as deeply entrenched and contextualized cultural agents, create “new” works of art that can communicate with and are interpretable within a cultural context. So far Margolis’ overriding focus on artworks has been on the metaphysics of these works as cultural entities that are distinct from and not reducible to natural or physical entities. In similar vein his work on the self has been to show how selves or persons are not reducible to biology and how thought is not reducible to the physical brain and body. Both artworks and selves, on his view, thus have “careers” that change with the course and flux of history, interpretation and reinterpretation rather than “natures” that remain stable for any purpose other than numerical identity. The question for this paper, then, is how such an encultured artist, who is also an individuable “self,” can within this framework construct an identifiable “career” that is both from culture and that develops culture in a way that involves a particular, as well as collective, contribution. The answer will be one that provides a theory of the artist as cultural agent: a person and thinking and doing practitioner that emerges from and works within a cultural context in which he or she acquires the tools and skills necessary to make something through the development of his or her natural competencies in innovative ways that make use of historical, cultural and lingual resources at his or her disposal. Indeed, as such, Joseph Margolis himself is an analog for such an artist, being both a product of his culture and historical era and a master craftsman and inventor who has woven strands from both analytic and continental philosophy into a discursive theory that is at once made of culture and emergent from it in a way that can be construed as a development of rather than restatement of what has gone before. In continuing his work into the realm of artistic practice this paper thus aims at both cultural (philosophical) emergence, and Margolis-emergence: it is an exercise in both interpreting Margolis and reinterpreting Margolis in an attempt to carry his philosophy of art, and of culture, into the next historical era in the philosophy of art, one in which the artist, not just the artistic product and not just the spectator, will come to the fore. In forwarding the cause of relativism with respect to a given domain of inquiry, Joseph Margolis tells us, we have two kinds of strategy to pursue. The first of these is to characterize the metaphysics of the domain in a way congenial to the relativist assignment of truth(-like) values. Margolis has himself chosen this strategy in his wellknown arguments for the “fuzzy” ontology of artwork and the cognitive intransparency of reality. The second is to characterize the practical terms of inquiry into that domain in a way similarly congenial to the assignment of such weakened truth values. Though Margolis offers some comments concerning which features of inquisitive practice might support such a characterization, such comments of his tend to be lean in both elaboration and support. I propose that we can achieve such elaboration and support through reference to an account of the marks that the concept of truth makes on norms of human behavior. Such a “practical account” of truth makes possible inferences from relevant behavioral norms within a domain of inquiry to features of the concept of truth operative within that domain. We may then consider whether those norms support the use of multivalent alethic assignments of the kind favored by Margolis’ relativism. A recent and influential practical account of truth is outlined by Huw Price in “Truth as Convenient Friction” (2003, republished 2011 in Naturalism Without Mirrors). Price’s central claim is that the practical significance of truth is the normative occasioning by disagreement of reason-giving conversation. I follow Price in this claim. His stated support, however, relies on a binary psychological mechanism of approval/disapproval. If this mechanism were explanatorily fundamental, the resulting practical theory would prematurely commit itself to a corresponding binary structure of truth in all domains. If we are to use a practical account of truth as a tool for investigating the appropriateness of relativism, therefore, we must augment Price’s theory with a richer range of human response than the approval/disapproval binary. I suggest that we take the relevant response to be that of rational reliance—such as trust—which can be given or withheld in manifold degrees and modes. Various degrees of such reliance are necessary in various domain, but nevertheless uffice to motivate conversation as the normatively occasioned response to disagreement. The resulting practical account of truth invites us to consider the kinds of cooperation called for in a given domain of inquiry. To the extent that the demand for cooperation is great and its conditions of success well-defined, inquiry into that domain will tend to admit bipolar truth values. To the extent that the demand is weak and conditions of success hazier, inquiry will be more congenial to relativism. The resulting theory supports Margolis in his claim that interpretive such as aesthetics and—to a lesser extent—ethics tend to be more admissive of relativistic truth assignments than, for instance, the practice of normal science. In Margolis’ hands, relativism implies a particular thesis on the relationship between the ontic and the alethic (‘alethic’ implying a meta-reflection on truth, viz. what sort of truth-values to apply): He suggests that alethic questions cannot be answered on a priori grounds but their answer depends upon ontological considerations. It depends on what we think the world to be like in a given domain of inquiry and how we think to have access to it. The deconstructive implications of this relativism are directed against the semantic principle of bivalence and related doctrines, such as tertium non datur and (the law of) excluded middle: Margolis’ rejects the a priori insistence on those bipolar principles which is widespread in much of the philosophical mainstream tradition. He opposes the traditional insistence that every declarative sentence expressing a proposition has exactly one truth value, either ‘true’ or ‘false’. Constructively, Margolis’ view implies to endorse a many-valued, ‘relativistic’ logic. He suggests that, in particular domains of inquiry, such as the theory of interpretation (of works of art), bipolarity should be given up in favor of values such as ‘apt’, ‘reasonable’, and ‘plausible’. The point of this many-valued logic is that apparent incompatibilities can be tolerated whereas they could not be tolerated under bipolar auspices: What appear to be intolerable contradictions under conditions of bipolarity can be accepted under the parameters of a relativistic logic. In this paper, I defend Margolis’ critique of bipolarity and his support of a many-valued logic against the pertinent critique (e.g. by Kalle Puolakka). I argue that it is absolutely mandatory to apply truth-values which allow tolerating for what are considered to be incompatible claims under conditions of bipolarity (obviously, the notions of ‘toleration’ and ‘incompatibility’ need to be specified in appropriate ways). Failing to do so would make the alethic domain fall back behind our best epistemological and ontological insights: Given our current insights into the inescapable historicity and thus limited nature of our (possibilities of) knowledge and into the complexity of our life-world, the alethic domain must be construed more ‘tolerant’ than traditional concepts of bipolarity allow. I will argue that construing the alethic in a tolerant fashion is important in several cultural domains. I will show that by drawing on examples from e.g. the theory of rational decision-making and the pluralist theory of religion. However, I will pursue the issue of construing the alethic in a tolerant fashion more explicitly in a pluralist direction than Margolis with his strong emphasis upon relativism does. This paper discusses some themes central to Margolis’s view in Edmund Husserl’s (1859-1938) approach to the sciences. In Formal and Transcendental Logic (hereafter FTL, 1929) Husserl’s approach is a combination of ‘Besinnung,’ that is, sense-investigation, and transcendental phenomenology. The purpose of the former is to describe the sense of a science for the practicing scientists. Instead of describing what the scientists are doing, the sense-investigation aims at finding out what the scientists think they are aiming at, i.e., the goal or the ideal they think they should ultimately achieve within their practices. The goal, according to Husserl, is what makes the science science. Finding out the sense of the sciences then helps us to determine the norms at work in the sciences. I will argue that one consequence of such an “anthropological” approach is an acknowledgement of plurality of scientific norms. The sense-investigation should be complemented by transcendental phenomenology, which makes explicit the presuppositions and achievements of our consciousness that make the sciences possible. Interestingly, for example, according to Husserl, one presupposition of scientific investigation is the belief that every claim is ultimately either true or false, i.e., scientific realism. The two above mentioned methods can be used for critical purposes to find out whether this or that phenomenon is genuine, that is, it agrees with its essence. Furthermore Husserl holds that we should not simply take the essence of science from the traditional and present aimings of the scientists, but while so doing, we should critically clarify it and renew its final sense. The idea of renewal brings a normative element to Husserl’s otherwise rather descriptive sense-investigation: the description of the ideal is not “blind” but critical and it has to be continuously renewed. The Crisis complements the FTL by emphasizing the role of tradition and taking into account the life-world, in which we all, including the practising scientists, live in. Guided by the norm of truth, the scientists collaboratively examine the objective world on the basis of the evidence of the life-world. The scientific objectivity thus becomes constituted in the scientific institutions that have been established for the sake of truth. Husserl’s view of the sciences thus appears to come close to the form of realism advocated by Margolis. Like to Margolis, according to Husserl our view of reality is constituted from what is given in experience. Nevertheless, we do not construct reality into existence. Pragmatism’s oldest and most fundamental goal has been to make philosophy matter in practical life. Pursuit of this goal has required of pragmatists two necessary steps. First, they have had to criticize the philosophical systems and distinctions most responsible for separating theory from practice and rendering impotent philosophy’s more constructive cultural contributions. Second, they have had to propose what should take the place of those systems and distinctions. Over the past 130 years or so, pragmatists have come to understand that this clear-and-rebuild process must be renewed again and again because each period presents it’s own particular challenger. (Peirce battled Cartesianism, James battled Absolutism, Dewey battled orthodox realism, and so on.) And while there is something wearying about having to repeatedly defend the fortress, the fact that pragmatism has endured (to fight again) testifies to something genuinely valuable at its core. One of pragmatism’s most important and ingenious defenders over the past 20 years has been Joseph Margolis. His critical and constructive work has sought to defend (e.g. against neopragmatist or “linguistic” pragmatists) a vision of pragmatism which honors the spirit motivating Dewey and James’ experience-based pragmatism while seeking to reinvent their vision for our 21st century world. This paper will discuss what I take to be the core of Margolis’s approach, a kind of “continuity thesis” that not only provides us with a replacement for epistemological and moral “objectivity,” but also sketches a historicized naturalistic picture that satisfies the dual needs of holism and explanatory power. Margolis’s strategy deploys what he calls “the conceptual bridge between world and language” in which there is “the constituting mediation of a human framework indissolubly symbiotized between…subjects and objects.” In this unique and promising pragmatic vision, he argues that human language is always “worlded” while the world is (always) already “languaged.” By renovating pragmatism in these terms, Margolis helps us understand the limitations of the “linguistic turn” pragmatists without simply calling for a return to older vocabularies. The paper concludes with some discussion of the various avenues opened up by these innovations, especially in our interpretations of John Dewey as well as our more general understandings of the human self. In recent work, Joseph Margolis takes up the twin projects of both assessing pragmatism’s contribution to, and state of play in, contemporary philosophy, on the one hand, and putting forward a philosophical anthropology that in his own terms combines Hegel and Darwin in a pragmatic way. That is, Margolis develops a model of the formation of the human agent as an admixture of biological causes, ‘external bildung,’ and cultural formation, internal bildung.’ The combination that Margolis proffers is an attractive one, and is enlisted in overcoming the ‘vicissitudes of transcendental philosophy’ in many of its contemporary guises. However, in his attempt to avoid the traps of false necessity and the hypostatization of essences in philosophical argument, it is unclear if his model does not require clarification. In this paper, I would like to take issue with the overemphasis on the amount of weight given to the concepts of ‘ historicity and artifactuality’ as the key elements of human self-creation. That is, it is unclear if this conceptual distinction can do the work of both avoiding the reifying tendencies of transcendental philosophies, on the one hand, and Darwinian readings of human being and their activities that cannot be so easily combined with historical, interpretive, and narratival self-understanding in its richest and most meaningful sense. It is not suggested that something other than ‘naturalism’ is required with regard to the latter point. It is rather that, as it stands, historicity and artifactuality, are in need of richer elaboration to sustain the weight they must bear. I highlight dimensions of Joseph Margolis’s work that are critical of pragmatism. Following Margolis’s treatment, I argue that pragmatism convinces and inspires in its resolute analysis of the category of practice; its (soft) naturalism (which includes its incorporation of Darwinian and post- Darwinian biological standpoints, as well as other discoveries of the empirical psychological and social sciences; and its interest in adequately understanding and articulating the place of human beings and human processes in nature); its historicism (including Peirce’s fallibilism and his prescient acknowledgment of the importance of tradition to scientific, philosophical, and everyday inquiry); and its continuuism (as in Peirce’s synechism, which may plausibly be construed as counseling suspicion in the face of proposed dualisms, necessitarianisms, and forms of “cognitive privilege” [as Margolis has put it]). Yet these “consequences of pragmatism” are hardly universally drawn among contemporary pragmatists; and individual pragmatists’ developments of these themes (aspects of those of Peirce, James, Dewey, Rorty, Putnam, and Brandom, in particular) remain unconvincing in their details. I briefly sketch Margolis’s position vis-à-vis these rival voices. The pragmatist tradition is characterized – perhaps even most clearly identified – by its efforts to use the category of practice as a means of explicating philosophical concepts (such as truth, reality, value, and normativity) and solving philosophical problems (such as the problem of skepticism). Yet it is unclear to what extent the classical pragmatists were successful in these aims, nor to what extent success along these lines is to be expected. Regarding the theory of truth, for instance, I argue that Peirce’s assignment of truth to the results of “infinite inquiry,” James’s defense of the epistemic right to “will to believe,” Dewey’s definition of “truth” as “warranted assertability,” and Rorty’s denial of the legitimacy of the concept of truth as “correspondence to reality,” constitute a series of especially tenuous innovations. Furthermore, the work of contemporary pragmatists fails to convince in the conceptually arbitrary principles by which it reconstructs the historical tradition of pragmatism itself (for instance: the barely hidden nationalism that motivates the characterization of pragmatism as an, or the, especially “American” tradition of philosophy), and its tendency toward an unreflective humanism and anthropomorphism (a point on which I take issue with Margolis’s views). I close with some reflections on the possibility of a “post-pragmatist” phase of philosophy, a phase in which Margolisian commitments could well lead the way. I argue that, given its characteristic concerns and innovations, pragmatism may be compared to two other traditions of 20th century philosophy: the largely European tradition of Philosophical Anthropology (particularly the work of Helmuth Plessner and Arnold Gehlen), and what might be called “the Philosophy of Culture” (prominently including parts of the work of Herder, Hegel, Nietzsche, and Wittgenstein). Joseph Margolis’s work may be read as much as a contribution to these traditions as to pragmatism. Philosophical Anthropology exhibits a closely parallel set of strengths and weaknesses to pragmatism (indeed, closely parallel to the tally given above). Philosophy of Culture, on the other hand, is currently inchoate, yet promising. Community is an important concept for pragmatists: Peirce’s logic focused on the inquiries of a community of inquirers; and Josiah Royce’s understanding of Christianity and the good was formulated in terms that he had learned from Peirce’s views about signs and interpretation. Religious experience, for example, can involve identifying yourself as a member of a extensive, or even universal community. The paper will explore how how Royce used ideas from Peirce’s theory of signs to give a theoretical account of such phenomena. I shall explore how this understanding of community can illuminate Peirce’s account of inquiry. I shall also discuss defend the view that these ideas illuminate pragmatist accounts of the good. In concluding the paper, I shall comment on how of these ideas contribute to the idea of culture. Joseph Margolis has developed an integrated metaphysics of culture, whose multiple strands include epistemic relativism, philosophical cultural anthropology, and metaphilosophy. Competently informed about many areas and distinct historical and contemporary morements in philosophy, Margolis’s work impresses among other ways especially by its extraordinary range and commanding overview of a vast field of ideas, and by its sensitivity to the motivations of conflicting methods in a variety of traditions. Margolis wants to properly and sympathetically understand the trajectory of philosophy’s path, not merely to appreciate the strengths and identify the weaknesses of particular chapters and episodes of thought in order to take sides and lend his voice to the positions he finds most promising. Rather, Margolis seeks out powerful commonalities in order to discern larger more deep-running trends. In his most recent book, Pragmatism Ascendent: A Yard of Narrative, a Touch of Prophecy, fourth in a series of extensive philosophical discussions of explorations of the theme of pragmatism, Margolis does exactly this. Margolis describes a narrative arc for the direction of Western philosophy since the time of Immanuel Kant, in which a crisis is supposed to have resulted in two directions, affecting both its major impulses, first, from the conflicted resources and programs of post-Kantianism, reflected in the impasse over realism and Idealism, as particularly revealed in G.W.F. Hegel’s criticism of Kant leading to a chaos in contemporary continental thought, on the one hand, and to the sterility and vacuity of analytic philosophy that has not met its promise and continues to recycle undemonstrated articles of faith in continued research programs that seem to lack essential motivation with respect to the understanding of human life that Margolis considers vital to any genuine philosophy. What emerges from the contemporary morass, if Margolis right, as a ray of hope, is the prospect of a re-energized pragmatism, with roots in the American grain, but triumphant in its Hegel-inspired or fellow traveling distrust of Kantian apriorism, and especially its commitment to an epistemic fallibilism and historicism, shorn of C.S. Peirce’s metaphysical excesses and insupportable regulative concept of truth embodied in the doctrine of hope that a community of inquirers will eventually arrive at the truth over endless time as an asymptote in an imaginary future that is never to be attained in real time human inquiry. Margolis projects what he sees as the only and in some ways inevitable road for philosophy to take in light of the abject break down of post-Kantianism and analytic holdovers of logical positivism. I am fundamentally in agreement with much of Margolis’ assessment of the progress and prospects of pragmatism, but in this presentation I want to take issue with Margolis’ starting place, in order to show that the concept and promise of pragmatism which Margolis supports can be upheld independently of the bleak present scenario Margolis paints of philosophy’s desperate need for renewal through something like a revisionary Hegel-rooted pragmatism. I see no crisis in contemporary analytic philosophy, but a brilliant flourishing of new ideas and inventive strategies for working through a variety of problems, and I do not in any case regard unity of research programs or agreement on assumptions and presuppositions as a sign of vitality specifically in philosophy. Rather than reconsidering Margolis’ disappointment with analytic philosophy, however, I want to raise questions about Margolis’ understanding of Kantianism in the conflict between Kant and Hegel over the basic principles of Kant’s classical critical idealism. I suggest that Kant as much as Hegel is an inspiring force of contemporary pragmatism, both in its history and in the branch that Margolis projects as showing the way forward into philosophy, not arising from Kant’s ashes, but within a Kantian structure that is more friendly to pragmatism than Margolis appears to allow. By focusing on Kant’s Prolegomena to Any Future Metaphysics That Can Come Forth as Science, a text Margolis does not mention in the target discussion, as well as the first Critique, and offering another interpretation of Kant even within the Critique, I propose to show that Margolis’ aspirations for a neo-pragmatism can be more properly and authentically Kantian than Hegelian, while placing Kant in better light as a founding figure of Peirce’s pragmaticism and later tributaries of pragmatism to the present day, and hence potentially for its future. If I am right, then the main thrust of Margolis’ discussion in Pragmatism Ascendentis more powerfully upheld, because it will have been shown to be independent of any particular reading of the Kantian background. One of the leading themes of Joseph Margolis’s lifelong work is the thesis of the cognitive symbiosis which claims that the relationship between (speaking) subjects and (discursible) objects, and between (worlded) language and (languaged) world is an artifact of, and discernible only within, the indissoluble symbiosis of those two (Margolis, 1995, p. 71). In one way or other, Margolis has profoundly addressed the issue of cognitive symbiosis in most of his texts. As this paper is going to argue, however, Margolis’s thoughtful treatment of this topic is limited to analyzing the notion of cognitive symbiosis from the viewpoint of language users and their historically and culturally co-constructed worlds. If we want to stay true to the naturalist heritage of the classical pragmatists, however, we need to subscribe to what Mark Johnson (2007) has dubbed the principle of continuity (p. 122-123) which states that human knowledge, articulable in propositional terms, is of derivative nature with respect to our bodily and practical attunement to the world. In other words – in the authentically pragmatist view – the linguistic behavior grows out of our bodily make-up as well as our dynamic relationships with the environment (both physical and social). Hence, for the pragmatic naturalists, our interactions with the world are first and foremost practical in nature, and only secondarily, or derivatively, linguistic. This paper is going to argue that Margolis’s highly important analyses of the linguistic entanglement between the knower and the known should nevertheless be supplemented by a pragmatist account of the ways in which the organism and the environment co-construct one another prior to (in a logical sense) the emergence of language and enculturation proper. My main conceptual sources in unfolding this view will be the naturalist accounts of consciousness and action of George H. Mead and John Dewey, further supported by findings of present-day life sciences. My paper will first analyze the pragmatic treatment of goal-directedness of action, especially with regard to Mead’s notion of attitudes, and relate it to certain contemporary epistemological theories provided by the cognitive sciences (Humberto Maturana, Giacomo Rizzolatti, James Gibson, Andy Clark, etc.). On the background of those, the paper is going to present a philosophical as well as an empirical justification of why we should interpret the environment, its objects and structures, in terms of possibilities for action. In Mead’s view, objects and events of the perceived world emerge within stable patterns of organism-environment transactions which he called “perspectives”. According to pragmatism, as well as certain branches of cognitive science (embodied and extended cognition), perception and other cognitive processes include not only neural processes taking place in our heads, but in a direct fashion, also the world itself. I will argue that it is precisely within the matrix of what Mead called “perspectives”, where the cognitive symbiosis takes place at the most basic, non-propositional and non-intentional, level. In conclusion, the paper is going to propose a redefinition (or better put – widening) of another of Margolis’s important terms: constructive realism (2001). In the new reading, this will make reference to the pragmatist claim that environmental structures and events exist objectively, albeit they do so only in relation to embodied agents which are capable of skillfully engaging their worlds. Given the subject of our conference, the intention of this paper is, of course, plural. First, it is a public reflection on my experience as Joseph Margolis’ neighbor, student, assistant, traveling companion, friend and, now, as a teacher in his own right trying to pass on the lessons learned in that evolving tutelage. It is also an exploration of these lessons as I attempt, again, to work out a project Prof. Margolis inspired: a unique reading of C. S. Peirce’s “fallibilism,” and its bearing on our understanding of self and culture. Finally, this paper points in the directions where I think Margolis is leading us, if we take seriously his thoughts on historicity, relativism and the hybrid entities we call our own human selves. As such an account is, by its very nature, resistant to direct and brief articulation, I will say only a few words about each aspect here, and trust that anyone familiar with Margolis’ work will be able to glimpse the larger picture that emerges from the confluence of its varied themes. My first encounter with Prof. Margolis came in the form of a desk lamp. When I first relocated to Philadelphia for graduate school, I found myself renting a flat across the street from the house Joe and his family. I’ve lost count (for many reasons) of the times I’d see the light from the window to his study as I left my apartment on a Friday evening. Without fail, that lamp would still be burning when I made my way back home, often in the early hours of the morning and a bit more unsteady than I had been when I set out. This lamp, like the impressive body of work it helped produce, continues to be both a challenge and an inspiration to me; it symbolizes a special sort of diligence that Margolis has come to master. By “diligence” I do not just mean hard work, long hours or prolific writing. I mean also an understanding of the implications, biases, prejudices and promises of our most basic concepts and cherished beliefs, and a willingness to revise and revisit them with an eye to overcoming our current impasses. This is, of course, a well-known feature of Margolis’ account of historicity and robust relativism, but I came to learn it through a chance encounter with one of Margolis’ many essays on Peirce. This paper, “Re-thinking Peirce’s Fallibilism,” has become the inspiration and focal point of much of my own work on pragmatism, language and the philosophy of human selves and culture. I am amazed, still, by just how far-reaching and varied the implications of this one simple argument are, not just for pragmatism, but philosophy in general and, possibly, much more. More recently, I have had the opportunity to work with several excellent student to explore the ways in which Margolis’ central themes relate to the present and future concerns of philosophy and beyond. This experience has brought me full-circle, as it were, revealing in even greater detail the lessons Joe taught me and which I hope to pass on to others. Philosophers have tended to overlook the conceptual dependence of any promising analysis of categories like normativity on presuppositional considerations regarding competing theories of what it is to be a human person (or for that matter, the significance and bearing of history or enlanguaged life). I associate all this with what I term the “Darwinian effect,” which I apply particularly to the strong tradition that stems from Kant and his champions and critics down, say, to what is now called the “Pittsburgh School,” which is currently engaged in a recovery of as much of the Kantian position as its members suppose can be salvaged. This forms part of the backdrop of the paper itself: I provide only some brief hints about all this. The paper engages the views, chiefly, of Wilfrid Sellars and John McDowell (and only small asides on Brandom), because the Pittsburghers are occupied with the prospects of a lean variant of a Kantian-inspired account of normativity—associated, for instance, with the recuperative power of Sellars’s notion of the “space of reasons” (offsetting, as in McDowell, the notion of “disenchanted nature”). What I have in mind in turning to the Darwinian effect is concerned more with post-Darwinian reflections on the strange fit of the human role in evolutionary theory and in terms of paleoanthropological speculations about the emergence of the human self or person. The main thrust of the paper, however, rests with an assessment of the strengths and limitations of the Pittsburgh efforts to understand normativity and with the competing strength of the very different conception that is both demanded and enabled by the import of the Darwinian effect. The essential premise of the entire argument rests with the reasonableness of thinking of “self” or “person” as a hybrid artifact (engaging biological and cultural formation) and its bearing on the artifactual standing of normativity as well. I apply this, for instance, in a novel way to the currently debated issue of the relationship between normativity and naturalism; and, accordingly, to the paradigmatic fortunes of the Kantian tradition and, more narrowly, to the fortunes of the Pittsburgh group. Over the course of his philosophical career, Joseph Margolis has become best known for his contributions in the philosophy of art and his commitment to Pragmatism. However, all too often, commentators have treated his views in the philosophy of art, including his non-reductive cultural ontology, relativistic theory of interpretation and account of the perception of artworks, as independent of his trenchant defense of Pragmatism as the philosophical framework best adapted to reconcile the differences between the Continental and Analytic traditions in philosophy. This interpretation of Margolis’s work is perhaps reinforced by his own presentation of his views. His recent books either deal directly with problems in the Philosophy of Art (for example The Arts and the Definition of the Human and The Cultural Space of the Arts and the Infelicities of Reductionism) or with the potential of Pragmatism (including Pragmatism’s Advantage and Pragmatism Ascendent). Even Margolis himself rarely, if ever, speaks of his own work in the philosophy of art as constituting a pragmatist aesthetics. It is the purpose of this paper to show how Margolis’s diverse contributions to philosophy are best understood as forming a multifaceted argument for a pragmatist theory of culture that underlies his more local views in the philosophy of art, epistemology and metaphysics. The first section of this paper shall lay out the basic tenets of Margolis’s commitment to Pragmatism and show how this informs his constructive realism and his evolutionary account of the human person and its powers derived, in part, from Margolis’s novel appropriation of the Hegelian concept of bildung. Next, I shall show how these two views form the framework in which Margolis provides resolutions of canonical debates in the philosophy of art. Rather than discussing Margolis’s philosophy of art writ large, I shall focus on Margolis’s debate with Arthur Danto regarding the perception of artworks and other cultural entities. Not only does Margolis’s attack disclose the paradoxical formulation of Danto’s own account of perception and his definition of art (and by proxy the entirety of analytic aesthetics that has followed in Danto’s wake) but it also illustrates how any responsible theorizing about the nature of the cultural world must take its cue from an account of the human person, a commitment characteristic of Margolis’s pragmatism. Finally, this paper shall conclude with a brief synopsis of the central claims of a Margolis-style Pragmatist philosophy of culture and suggest ways in which this view offers the best legitimating framework from which to approach philosophical problems of the human world. Margolis on Quine: Fact or Fiction? This paper offers a critical examination of Margolis’s interpretation of Quine’s naturalism and further examines how it impacts Margolis’s own cultural pragmatism. It challenges his central claim that Quine’s view is a form of scientistic reductionism by revisiting some of the main motives that define Quine’s approach to ‘naturalized epistemology’. Margolis assimilates Quine’s work to the project of ‘analytic scientism’, which he presents as consisting of three claims: 1. the world is independently determinate and knowable in such terms; 2. this determinacy can be adequately expressed in physical terms alone, with the human world fully described in such terms; and 3. because of 1 and 2 humans are portrayed as in principle no different from inanimate objects. I demonstrate how Quine’s view rejects all three of these claims by emphasizing how his naturalized account of knowledge is based on an explicit acknowledgement of the difference between the human element needed for the construction of scientific theories and the nature of the external world depicted by such theories. It further situates this point by applying it to Margolis’s critical exploration of the alleged similarity between Dewey’s and Quine’s behaviorist stance on meaning, and his conclusion that Quine’s approach is too extensionally reductive address the pressing cultural concerns of pragmatist philosophy. My alternative interpretation shows that Quine’s genetic account of knowledge acquisition resembles the type of cultural pragmatism that Margolis favors, which sees the determinate nature of the world as a construction within its possible determinacy, further rejects the view that the cultural aspects of human life can be reduced to the physical and finally recognizes judgments concerning truth as epistemically dependent on the motives of human inquirers. However, Quine takes the proper upshot of this view to reveal the scientific bankruptcy of the concepts of ‘meaning’, ‘mind’ and perhaps even ‘culture’ for addressing the demands of his scientific approach to epistemology. When viewed in such terms the dispute between Margolis and Quine highlights their basic disagreement over the aims of philosophy, one that is best understood as a conflict between scientific and cultural conceptions of philosophy. This suggests that Margolis’s interest in the cultural concerns of human life, while important, is not the most pressing issue that philosophy needs to address. Rather, the more fundamental issue is a self-reflective one that examines whether philosophical reflection should be confined to the professional, scientific and intellectual demands of philosophers or should play a more explicit cultural role in addressing the social and moral concerns of our time. Margolis’s own cultural philosophy itself lacks an independent argument for why the demands of these cultural questions must be met, while Quine’s technical, scientific vision seems to simply place them outside the purview of professional philosophy. How are we to then adjudicate this fundamental metaphilosophical disagreement? I conclude by suggesting the following unoriginal but surprising hypothesis: the acceptance of these contrasting conceptions of philosophy is so basic and thorough (as illustrated in the case of Margolis’s criticism of Quine) as to make neutral adjudication unlikely. The proposed paper will deal with one of the two strongest forms of relativism, according to Margolis’ own evaluation: Protagoreanism (the other being Incommensurabilism). What I will ultimately aim to show is that ‘archaism’ was well present in ancient Greek philosophy and that Protagoranenism was a formidable reply to it. In particular, I will show that the kind of relativism Protagoras defended is best understood as a form of robust relativism, namely the kind of coherent relativism Margolis himself advocates in his ground-breaking The Truth about relativism (Oxford 1991). I have already dealt at some length with archaism and with the philosophical analogies between Protagoras’ relativism and Margolis’ robust relativism in my study on Protagoras: Protagoras and the Challenge of Relativism. Plato’s Subtlest Enemy (Ashgate 2007; Chinese translation for China Remnin University Press 2012). Margolis himself recognized that it is productive to compare his robust relativism and Protagoras’ in the cover-blurb of my book he was kind enough to write (as well as in personal correspondence). By rehearsing the approach adopted in my Protagoras book, in the proposed paper I will show that Protagoreanism is an ancient form of Margolis’s robust relativism, in so far as it is a complex, three-fold thesis: alethic, epistemological and ontological. Protagoreanism—as reconstructed mainly in the context of Plato’s Theaetetus—is a doctrine that says something on the very nature of truth (that is why it is alethic). Protagoreanism is also a doctrine that says something on the conditions of truth (that is why it is epistemological); lastly—and perhaps more essentially— it is a doctrine that says something on the structure of the world (that is why it is ontological). Taken in such a fashion, Protagoreanism is a form of robust relativism that, as such, is immune—as Margolis argues at length in The Truth about relativism—from most of the charges that are levelled against relativism nowadays. In particular, if understood as an ontological doctrine, Protagoreanism provides a powerful ontology of the material world, an ontology that goes against Plato and Aristotle’s archaism, and that is very close to the kind of realism Margolis advocates. I intend the proposed paper as a tribute to Joseph Margolis, to the originality of his philosophy, as well as to his innovative capacity to read the history of philosophy under a truly refreshing light.